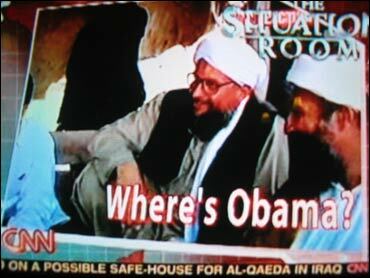 CNN apologized Tuesday for mistakenly promoting a story on the search for Osama bin Laden with the headline "Where's Obama?" The blunder came Monday evening on Wolf Blitzer's news show, "The Situation Room." Both Soledad O'Brien and Blitzer offered separate apologies during CNN's morning show on Tuesday. CNN called it a "bad typographical error" by its graphics department. "We want to apologize for that bad typo," Blitzer said. "We also want to apologize personally to Sen. Barack Obama. I'm going to be making a call to him later this morning to offer my personal apology." Tommy Vietor, Obama's press secretary, said he appreciated the bloggers and activists who brought the error to light so quickly and helped make sure it was corrected. "Though I'd note that the 's' and 'b' keys aren't all that close to each other, I assume it was just an unfortunate mistake and don't think there was any truly malicious intent," Vietor said.